It’s chill music. Men singing in falsetto in the background, a rhythm section that if sped up would sound like a serious funk band. A person could call it retro I suppose. But it is pretty difficult to decide exactly what it is paying homage to. 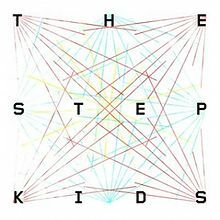 The sounds on the self-titled debut album from The Stepkids harkens back to a different time for sure. But it is a hybrid of musical styles. I think it is best described as “lo-fi neo-soul”. It sounds like a record The Turtles would have made if they didn’t have such bad management. Songs on the record have fun vocal arrangements that remind me of early Zappa material if Curtis Mayfield was playing the bongos in the band. It all is surprisingly simple and playful but vast and varied at the same time. Melodies are allowed to come through and grooves are created through simple bass lines that are backed by plenty of Oohs and Aahs. Highlights for me include “Brain Ninja” and “La La”. I think both tunes display what this band is all about. I am curious to see the direction this band goes. They seem to be flying under the radar a bit, but with a bit more exposure I could see them catching on. The album has a one minute long Intro, which is great, but what is even better is that there is a minute long Outro as well. These guys thought of everything! Previous Organ legend Jon Lord passes away.